A lot can be said about backup cameras and their practical nature, suffice to say that they are becoming increasingly popular nowadays for all the right reasons. Backing up can be quite scary if you lack full visibility of what’s behind your car, especially if you’re backup up into active traffic. A good way to protect yourself and your car in situations like those is to have the wisdom to employ a backup camera of sorts. And if it so happens that the camera has night vision capabilities, even better. With that in mind, let us take a look at the ten best backup cameras with night vision and what characteristics make them so special. 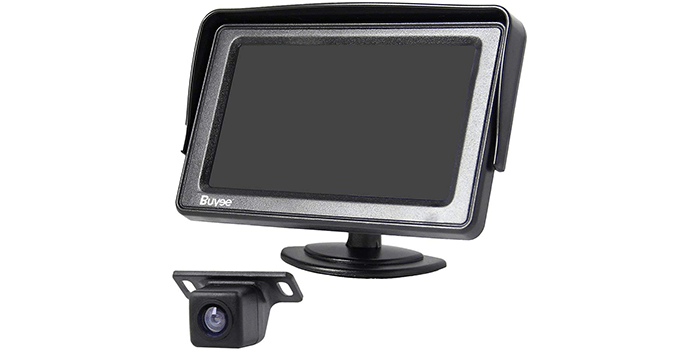 The Buyee Car Rear View Kit includes a high-quality TFT LCD display monitor measuring 4.3 inches, along with a 170-degree car reversible camera. Light in weight, compact in size and portable, and this kit can be carried around with ease for on-the-go video playback. Ideal for utilizing as a CCTV or for playing games, the screen comes with a 320 x 240 resolution and is designed in a premium grade black ABS frame and is resistant to water. When installed in automobiles, it includes the latest night vision technology that helps when backing up your car in dark areas. 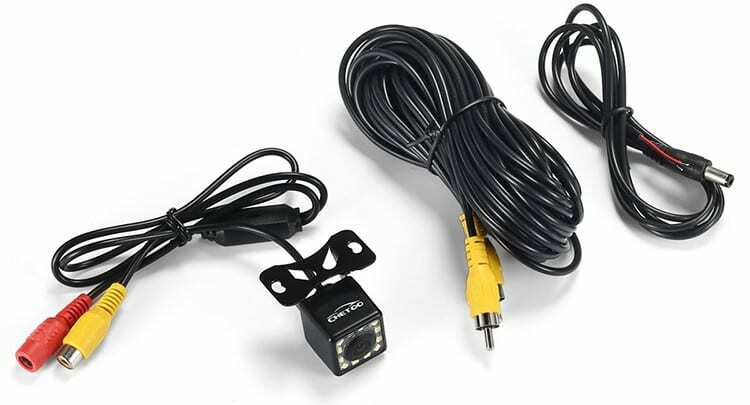 Made with heavy-duty materials to enhance its sturdiness, the Camecho Vehicle Backup Camera comes equipped with a 33-foot extension cord that makes it ideal for large vehicles including RV’s, trucks, buses, trailers, lorries, campers and more. Featuring a 7 inch LCD monitor with 2 channels and an automatic turn on and shut off function, it can be mounted onto the roof of your vehicle or on the dashboard, depending on personal preference. Along with this, the kit includes an IP 68 water-resistant rear camera with a 120 degree viewing angle. Easy to install with no need for an electrician, this rear view camera is durable, convenient to use, and high performing. The Moonet Car CCD Backup Rearview Camera is a premium grade vehicle backup camera uniquely designed for Nissan-370Z and 350-Z models. Along with the camera, the kit includes a 6-meter video cord and a power supply cable. Resistant to water and light in weight, this backup camera comes with light-sensitive chips that are automatically turned on when the car is reversing. Ideal for most DVD’s and monitors, the camera includes a wide angle lens that can rotate at 170 degrees. Offering clear visibility during dark hours, this rearview camera comes in NTSC mode and PAL mode, but your requirement must be mentioned when placing your orders. Providing you with an exceptional performance in dark areas, the Chetoo LED Backup Camera comes equipped with 12 super-powered LED lights. Easy to install and operate, it features a 33 feet AV cable that is ideal for large sized cars and SUV’s. Compatible with all car monitors that include an RCA input for rear view cameras, it offers a 170-degree angle that is wide enough and ensures optimum visibility. 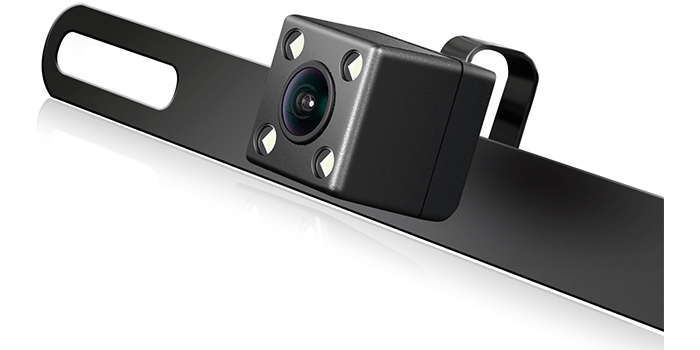 The XO Vision HTC35 high definition Universal Weatherproof Rear View Backup Camera is a high quality, lightweight camera that is designed to provide optimum visibility of the area behind your vehicle. Including inbuilt night vision technology and a wide viewing 170-degree angle, it reduces blind spots while reversing. Featuring an NTSC TV system and 420 TV lines resolution, this camera can withstand all weather conditions and is resistant to water. Thanks to its unique design and construction, it is extremely easy to install and does not require any technician. 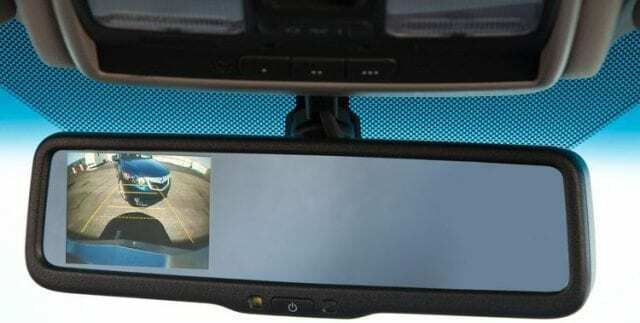 Designed with the ability to connect to a 12-24V DC voltage range, the eRapta ERT3 2nd Generation Car Rear View Reversing Backup Camera is compatible with most vehicles. Crafted with premium quality rubber ring made from resin with an IP69 water-resistant functionality, the camera sensor includes an adjustable lens with a 149-degree viewing angle. Thanks to its unique construction and automatic LED lighting, it can be mounted onto your vehicles license plate, providing you with enough visibility for you to safely park your car during the night. The Yada Digital Wireless Backup Camera is a heavy-duty, durable, water-resistant camera that is designed for easy installation over the license plate of your car. 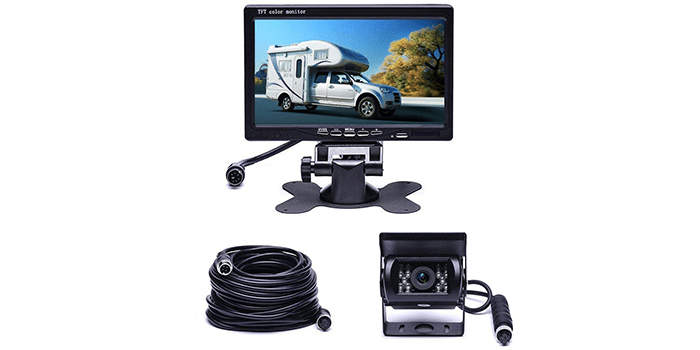 Featuring a 4.3 inch LCD monitor, it provides a clear view of the back of your car and comes with a premium quality suction cup that enables easy and stable placement. Equipped with a cable that is 16 inches long, it is designed to eradicate blind spots. Including wide angled camera lens, it provides a crisp sharp picture quality with the parking assistant feature. Thanks to its special functionality, it automatically transmits the images of the back of your car to the monitor, the second you place your vehicle in reverse. 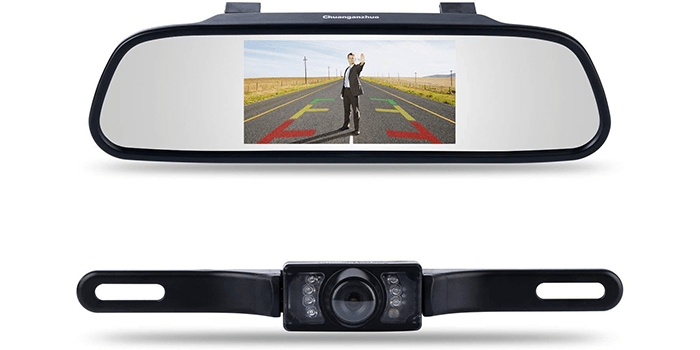 Chuanganzhuo Car Vehicle Rearview Mirror Monitor is a universal license plate backup camera that includes a water-resistant TFT LCD 12 V monitor that can be adjusted. Thanks to its unique technology and functionality, it automatically turns on as soon as you start backing up, giving you complete visibility of the area behind your car. Featuring a PAL and NTSC system, it comes with a 16:9 display format and a resolution of 480 by 272 pixels. 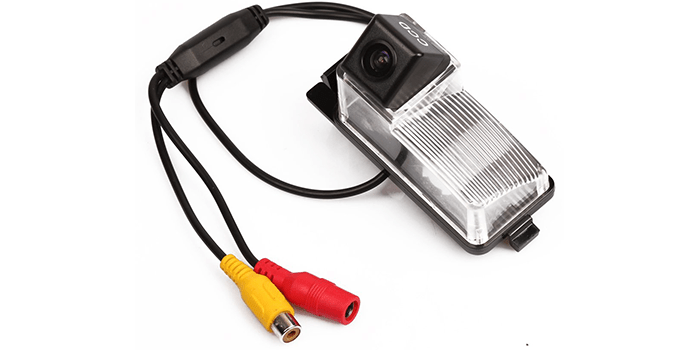 Including a wide viewing macro lens, 7 LED night vision and an HD colored CMOS imager, the backup camera can be easily mounted onto your license plate. Equipped with a colored CCD camera with a 130 degrees wide viewing angle, the Rear View Safety Backup Camera System comes with 18 infra-red lights that provide optimum visibility for up to 50 feet when in the dark. With the camera measuring 3.25 inches high, 3 inches long and 1.5 inches wide, the monitor measures 5.25 inches high, 7 inches long and 1 inch wide. Resistant to water with an IP69K rating, it features a 66-foot cable cord with connections that are aircraft graded. 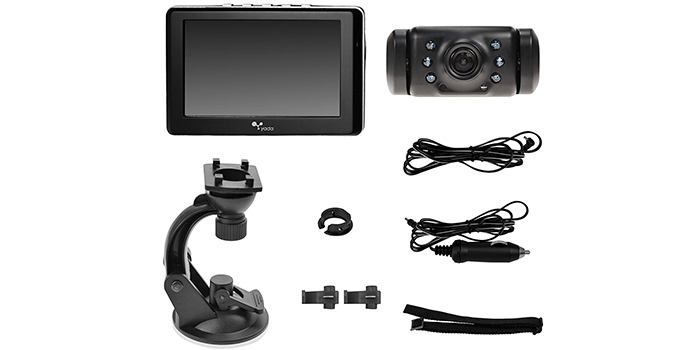 With a 7 inch TFT digital rearview monitor, this backup kit allows a universal mount and comes with an automatic NTSC/PAL video system. 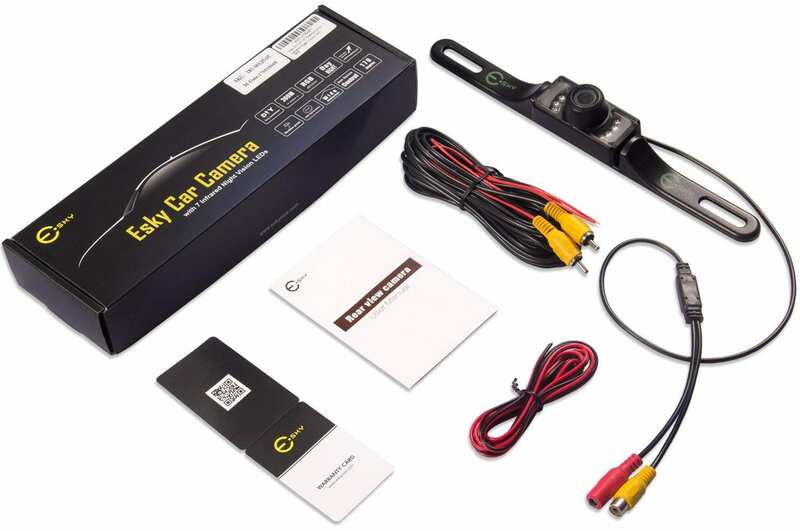 Providing a near-perfect perfect viewing angle, the Esky Rear-View Camera delivers a 135-degree wide view of the rear area of your car, whether you are driving forward or backing up. Equipped with 7 infrared LED lights giving you super night vision, it provides drivers with optimum visibility while backing up in dark spaces. Offering premium quality image resolution for up to 420 TV lines with a 1/4th inch colored CMOS, it features a water-resistant outer casing that is rated IP27 and that helps prevent outer damage while keeping it safe during harsh weather conditions.